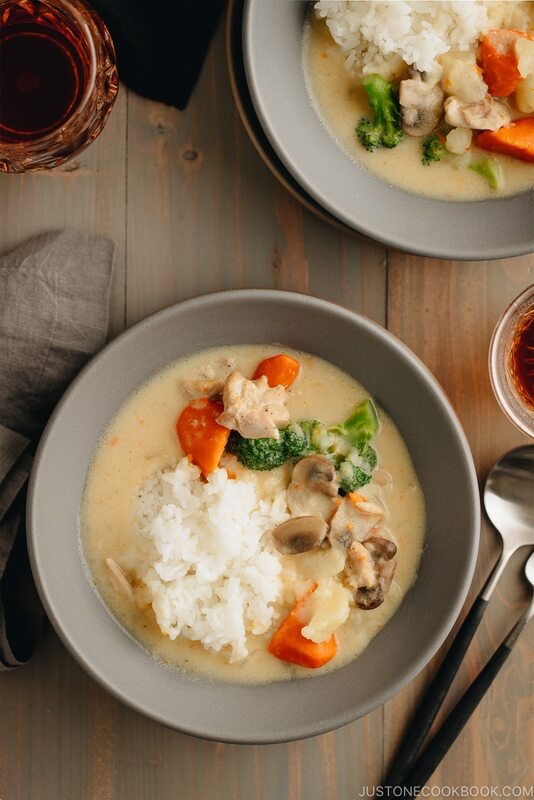 This creamy, hearty, and delicious Japanese Cream Stew is a popular western-style (yoshoku) dish consisting of chicken and vegetables with a savory white sauce. 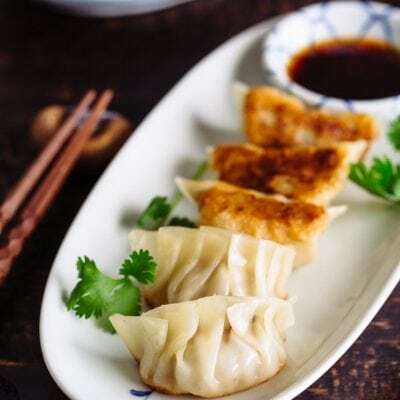 Cooked in the Instant Pot, it’s a true comfort food in cold winter months! The Japanese have an affinity for western-influenced dishes like Japanese Curry, Tonkatsu, Korokke (Croquettes), and Hayashi Rice (recipe coming soon). 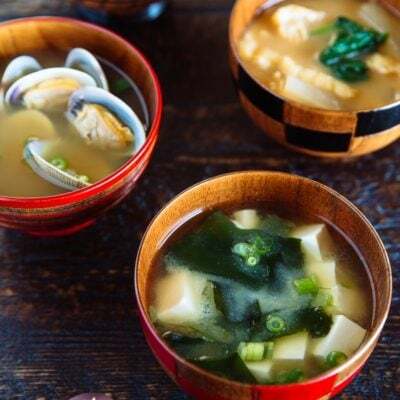 Known as the Yoshoku (洋食), they inevitably play a big part in shaping what Japanese cuisine is today. 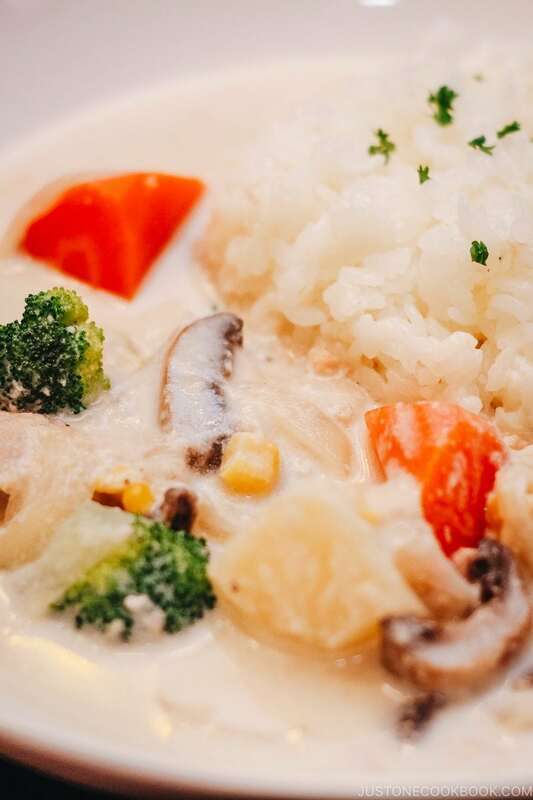 Cream Stew (クリームシチュー), or sometimes called White Stew (ホワイトシチュー), is one of those favorites you can find on the yoshoku menu. 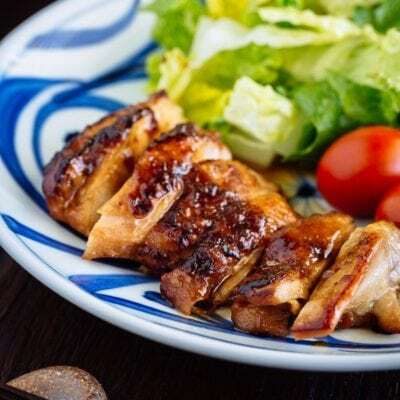 Many Japanese families with young children enjoy the dish frequently at both home and restaurants. 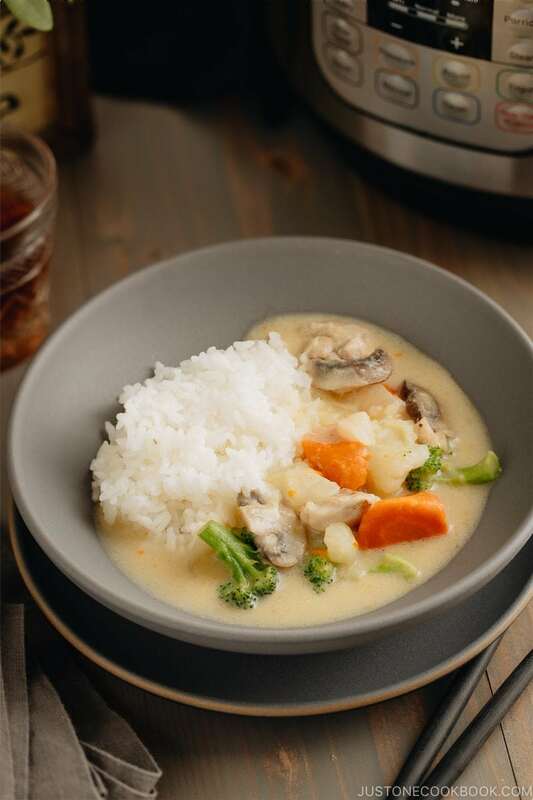 Today we’re making this delicious cream stew in my favorite Instant Pot! 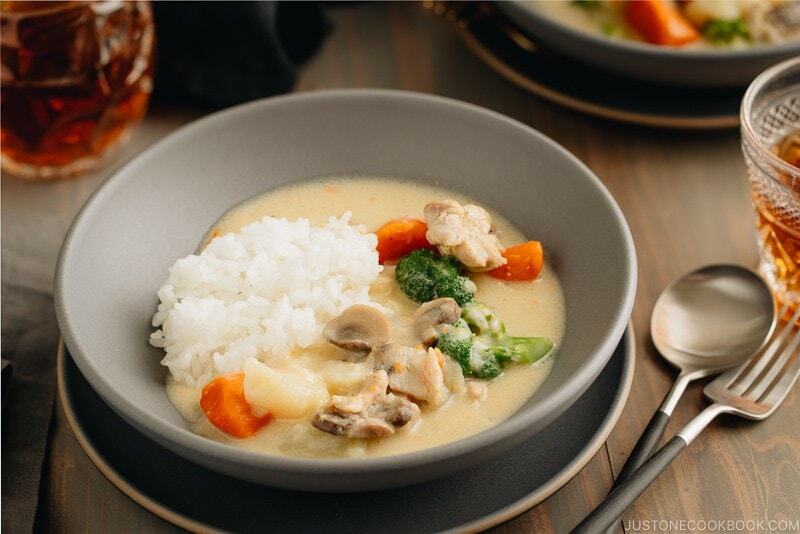 This creamy, hearty, and delicious Japanese Cream Stew is a popular western-style (yoshoku) dish consisting of chicken and vegetables with a savory white sauce. 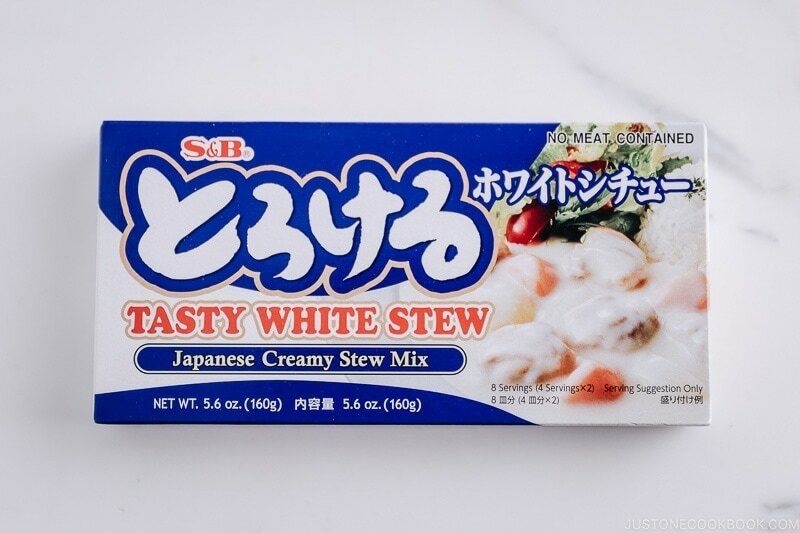 What is Cream Stew (White Stew)? You probably have some idea of what Cream Stew tastes like. 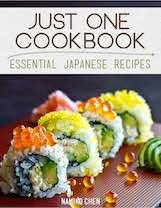 Interesting enough, there is no “Japanese” element in the recipe at all, yet it’s somewhat uniquly Japanese dish. 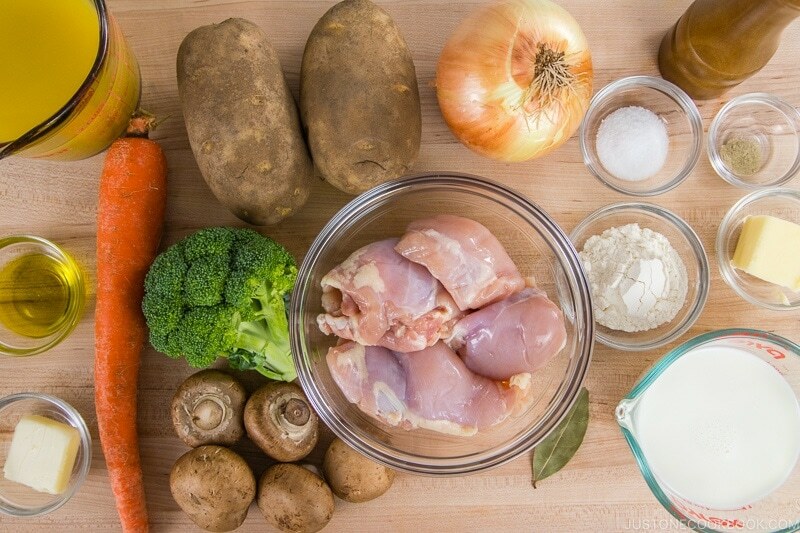 Here, chicken (or pork), onions, carrots, and potatoes are cooked in chicken or vegetable broth, and the white sauce roux (bechamel sauce) is added to thicken the stew. 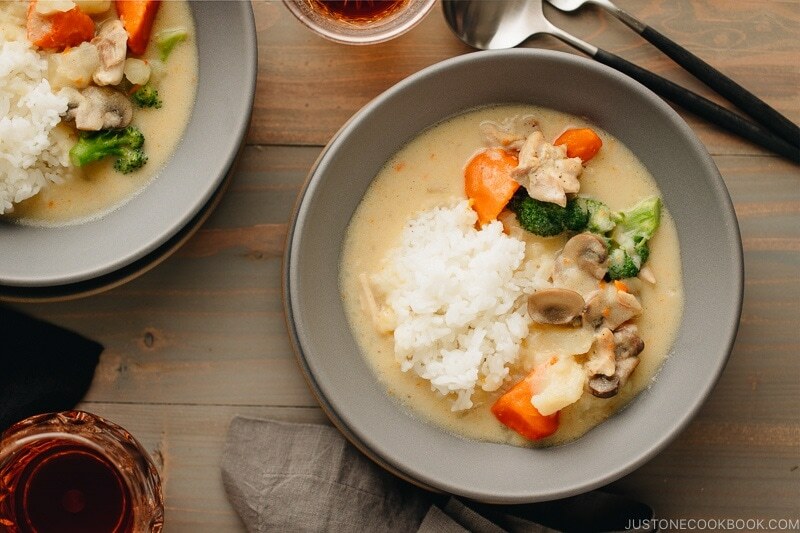 Why Cream Stew is such a family favorite? Aside from deliciousness, the cooking process is very similar to making Japanese Chicken Curry. Up until you add the roux (bechamel sauce), it’s pretty much identical to the base for curry. That means you can decide whether to make cream stew or curry at the last minute! 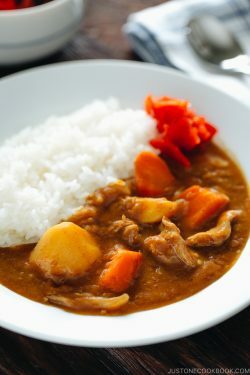 The Japanese love the convenience of using packaged Japanese Curry Roux or Cream/White Stew Roux. All you need to do is to dissolve the cubed roux in the pre-seasoned stew. However, today, we’ll make everything from scratch! 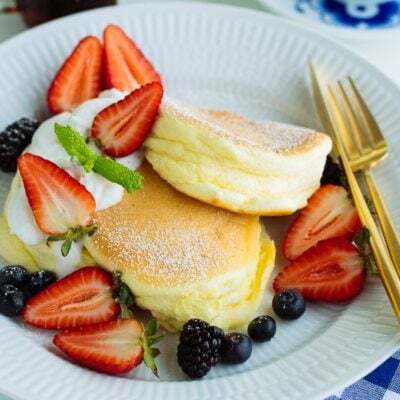 White sauce (ホワイトソース), or also known as Béchamel sauce, is a classic all-purpose French sauce made from butter, flour, and milk. 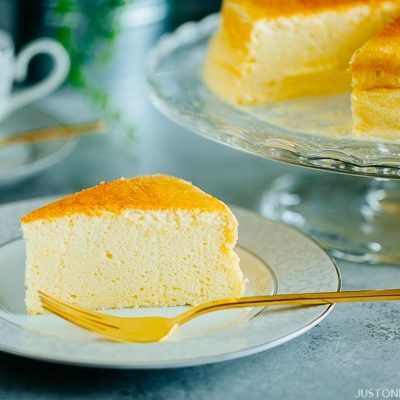 It pretty much forms the basis of French dishes, such as casseroles, cream croquettes, and savory soufflés. And it’s pretty easy and simple to make at home. Here are the 3 simple steps. Warm up the milk in the microwave or in a pot over the stovetop. Melt the butter, add flour, and whisk until flour is cooked. Gradually add warm milk until thickened to the right consistency. 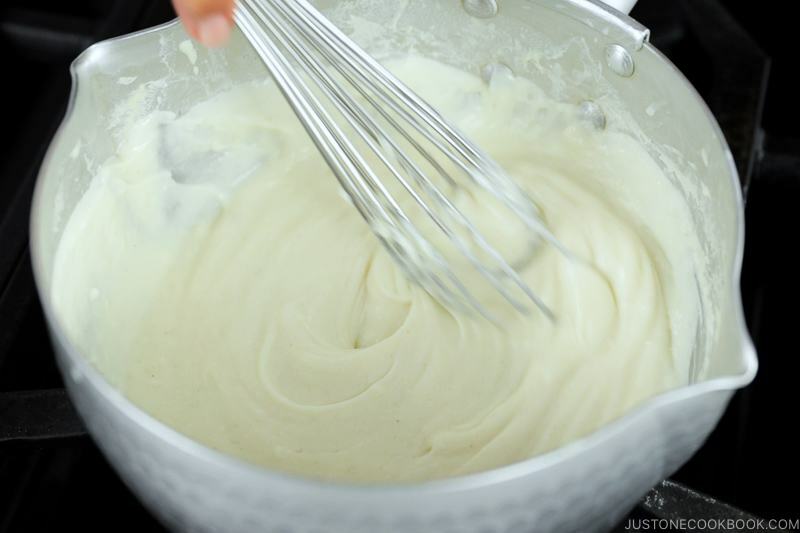 A roux is usually a mixture of equal weights butter and flour. Here in this recipe, I used 3 tablespoons (42 g) of butter and 3 tablespoons (45 g) of all-purpose flour. Besides butter, ghee, coconut oil or other fat can be used. You can also use gluten-free flour in place of all-purpose flour. The roux then will be mixed with 2 cups milk, and the amount can be adjustable based on how thick you want the sauce to be. In this recipe, I used 1 cup milk and 1 cup liquid from the stew. Chicken and pork are typically used as the main protein, but feel free to substitute with other choices. I think seafood works beautifully in the stew. For vegetarian, you can skip protein and use just the vegetables. Perhaps cauliflower or variety of wild mushrooms as your main ingredient. Onions, potatoes, and carrots are the basic vegetables in the cream stew. 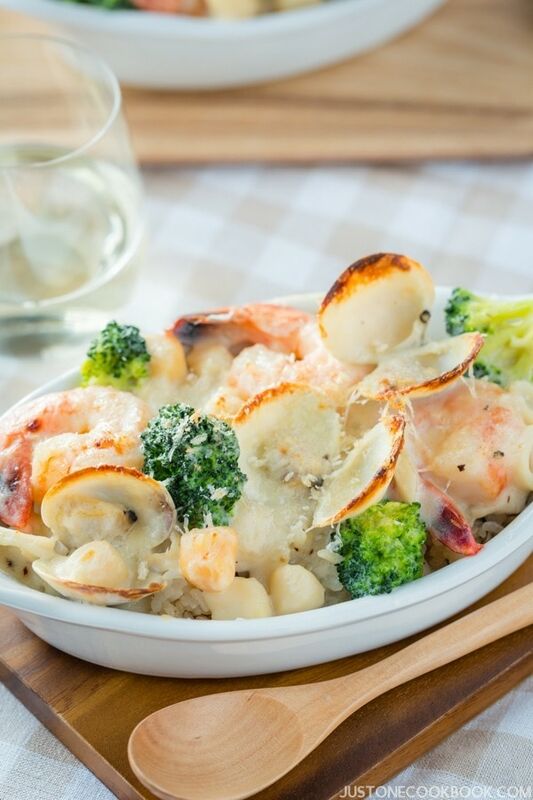 Most cream stew has some type of green vegetables; broccoli is a popular choice, then green peas and green beans. For potatoes, Yukon Gold potatoes have a smooth, slightly waxy, and firm texture. Russet potatoes have a creamy, crumbly, starchy texture, but they don’t hold their shape well. If you like to use this type, remember to cut into bigger chunks like I did. Button mushrooms are commonly used but some people use Japanese mushrooms like shimeji mushrooms and maitake mushrooms. I don’t recommend shiitake mushrooms as they have distinct flavors and fragrance that don’t go well with this dish. 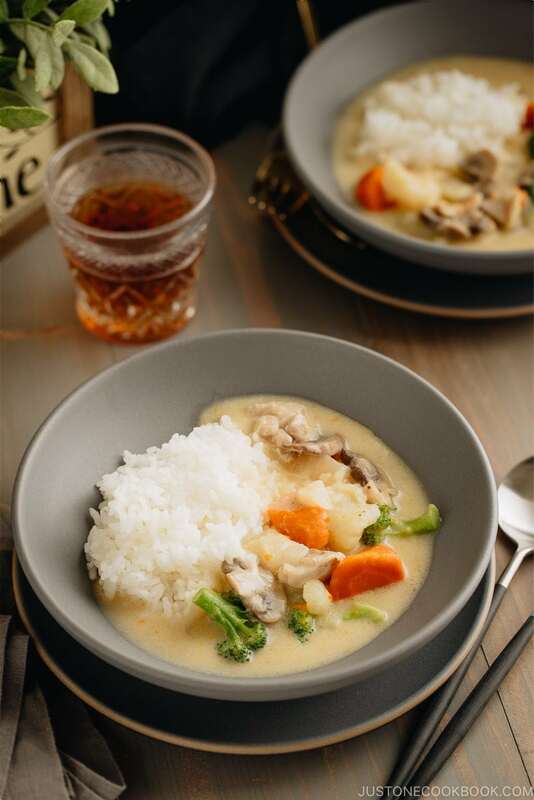 The packaged cream stew roux requires simple water, but when you make a homemade white sauce (bechamel sauce), I recommend using chicken or vegetable broth to create more depth and complexity in the flavors. Heavy cream, corn, and cheese are common additions to the cream stew. If you don’t own an Instant Pot, double the amount of chicken/vegetable broth (add more if broth doesn’t cover the ingredients) and cook all the ingredients in the pot for 20 minutes. The rest of the process is the same. 1. Cut vegetables into uniform sizes or adjust the cutting size. Each vegetable, whether hard or tender, must be cooked under the same amount of time in the Instant Pot. To achieve the perfect texture, you need to cut the vegetables into uniform sizes so they cook roughly at the same rate. 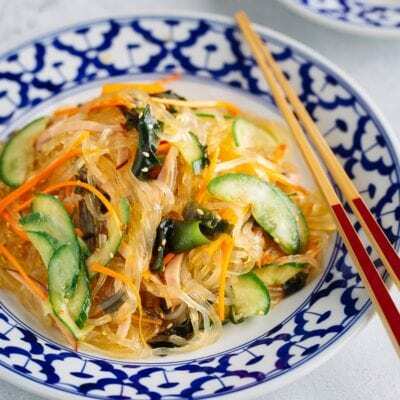 One trick to shorten the cooking time is to cut the tough vegetables slightly smaller sizes so they cook faster. If one vegetable tends to cook too fast, you may need to cut it into slightly bigger size. In this recipe, that’s Russet potatoes. If you cut the potatoes into the same size as other vegetables, these starchy potatoes will be disintegrated into the stew. Milk isn’t so great in the Instant Pot as the high heat and pressure separate the milk proteins and leads to curdling. Although it is perfectly safe to eat, it doesn’t look appetizing. Therefore, you have to make the white sauce in a separate pot, and then add the sauce after you’re finished pressure cooking. All you need to do is to combine and warm everything up on lower heat until the right consistency. 3. Add separately-blanched green vegetables at the end. Do not cook the green vegetables in the Instant Pot as they will change to dark and sad looking greens. Instead, blanch the green vegetables of your choice in a separate pot, and add them to reheat together. This way, you retain the beautiful color in your dish. I hope you add this instant pot cream stew to your family dinner rotation. Comforting, warm and delicious, it could well be on its way to becoming your kids’ nostalgic craving in the future. 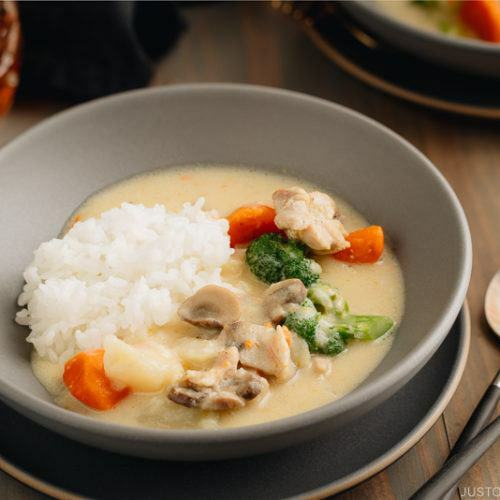 This creamy, hearty, and delicious Japanese Cream Stew is a popular western-style (yoshoku) dish consisting of chicken and vegetables with a savory white sauce. 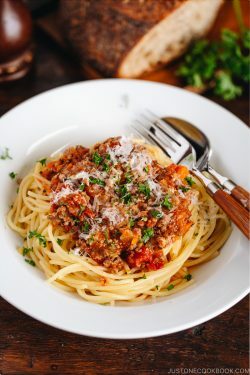 Cooked in the Instant Pot, it's a true comfort food in cold winter months! 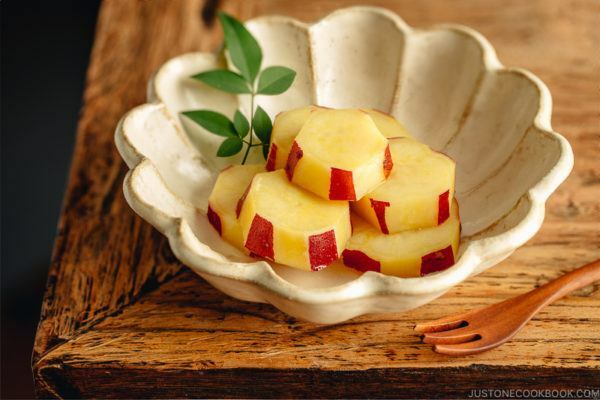 Peel and cut each potato into bigger chunks (if you want to keep their shape when serving). Peel the carrot and cut into smaller chunks. I use Rangiri Japanese cutting technique. Cut the onion in half lengthwise, and then cut each half into 6 wedges. Finally, cut them in half widthwise. Slice the mushrooms and cut the head of broccoli into florets. Cut the chicken thighs into smaller pieces. I use Sogigiri Japanese cutting technique to create more surface space so the chicken pieces cook faster. Season the chicken with salt and freshly ground black pepper. Press the “Sauté” button on your Instant Pot and heat 1 Tbsp olive oil and 1 Tbsp unsalted butter. When the pot is hot and butter is melted, add the chicken. Stir and coat the chicken with oil. Add the onion, carrot, mushrooms, and potatoes. Add the chicken broth and 1 bay leaf. Close the lid and set HIGH pressure for 2 minutes. Make sure the steam release handle points at “sealing” and not “venting”. The float valve goes up when pressurized. Heat the olive oil and butter in the pot over medium heat. Add the chicken and saute for 2 minutes. Then add onion and carrot and cook until coated with oil. Add the mushrooms, potatoes, broth (3.5 cups/800 ml), and bay leaf. Bring it to boil, then reduce heat to simmer (low) to cook for 20 minutes, or until carrots and potatoes are tender. While pressure cooking, blanch broccoli. Bring water to boil in a small saucepan. Once boiling, add a pinch of salt and broccoli florets. Cook until tender but do not overcook. Transfer the broccoli to ice water to stop cooking further. Once cool, remove, drain, and set aside. In a saucepan, melt the butter on medium heat but don’t let it brown. Microwave 1 cup of milk until it is warm to the touch and set aside. Once the butter is melted completely, add the flour. Stir quickly and constantly with a whisk to combine. Cook the flour mixture for 3-4 minutes, without letting it brown. Pour a small amount of the warm milk at a time, and stir as the sauce thickens. Gradually add the rest of the milk by whisking continually until smooth. Cook, stirring constantly, until starting to bubble and thicken. Lower the heat and add white pepper and salt to taste. Cook, stirring constantly, for 2 to 3 minutes. Remove from the heat and set aside. When it’s finished cooking, the Instant Pot will switch automatically to the “Keep Warm” mode. Let the pressure release naturally for 15 minutes and then proceed with the quick release by turning the steam release handle to the “venting” position to let steam out until the float valve drops down. Tip: Hold a kitchen towel and do not place your hand or face over steam release valve. The steam should be left only a little bit after 15 minutes of natural release. Open the lid and insert a skewer in the center of the potato to see if it’s cooked through. 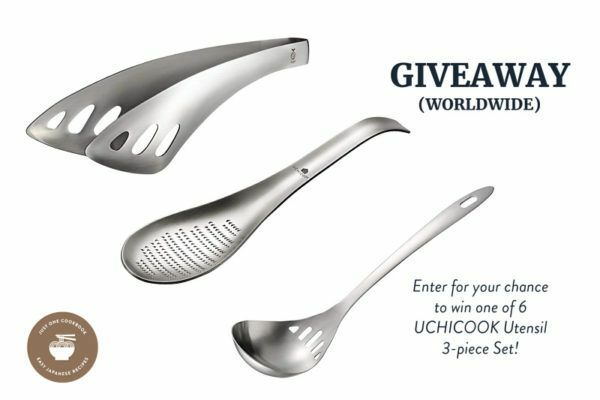 Using a ladle, take out 1 cup of soup from the stew. Put the white sauce back on the stove and heat on low heat. Add several tablespoons of the soup and whisk well to combine. Gradually add the rest of soup, stirring constantly, to combine. Put the white sauce back in the instant pot and gently mix the white sauce with the rest of stew. Press the “Sauté” button on your Instant Pot and press “Adjust” to set “Less” heat. The stew will thicken as it's heated. Season with freshly ground black pepper and discard the bay leaf if you can find it. Add the blanched broccoli and heat up. 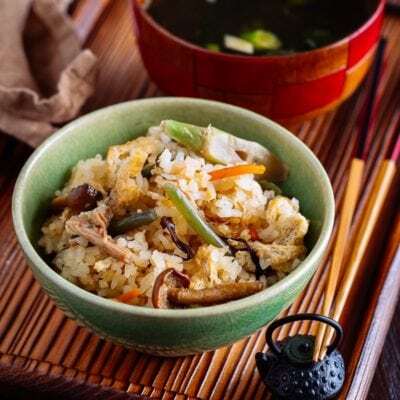 Serve the steamed rice on one side of the bowl and pour the Cream Stew on the other side of the bowl. If you use a packaged Cream Stew Roux, place 1/2 package of the roux on top of the ingredients (do not mix in) and close the lid to cook. Once pressure cooking is done, stir and wait to see how it thickens. Add more cubes to achieve the consistency you like. If you don't own an Instant Pot, double the amount of chicken/vegetable broth (3.5 cups/800 ml) and cook for 20 minutes. 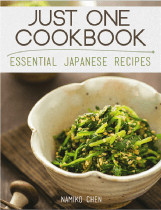 Recipe by Namiko Chen of Just One Cookbook. All images and content on this site are copyright protected. Please do not use my images without my permission. 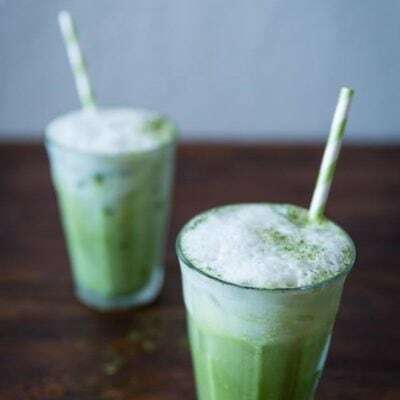 If you’d like to share this recipe on your site, please re-write the recipe in your own words and link to this post as the original source. Thank you. Definitely gonna try this! Looks really yummy for the cold weather. The bowl is lovely too! Hi Uayuil! Hope you enjoy this dish. It is so nice and comforting in winter time! Hi, if I use the packaged roux, what heat level and total cook time should I use? Thanks! Hi Helen! If you use a packaged Cream Stew Roux, place 1/2 package of the roux on top of the ingredients (do not mix in) and close the lid to cook (same way). Once pressure cooking is done, stir and wait to see how it thickens. Add more cubes to achieve the consistency you like. I simply love your simple tasty recipes. The pictures of the ingredients are one of the reasons that I use your recipes so often. Thank you. Hi Penelope! Thank you so much for your kind words. 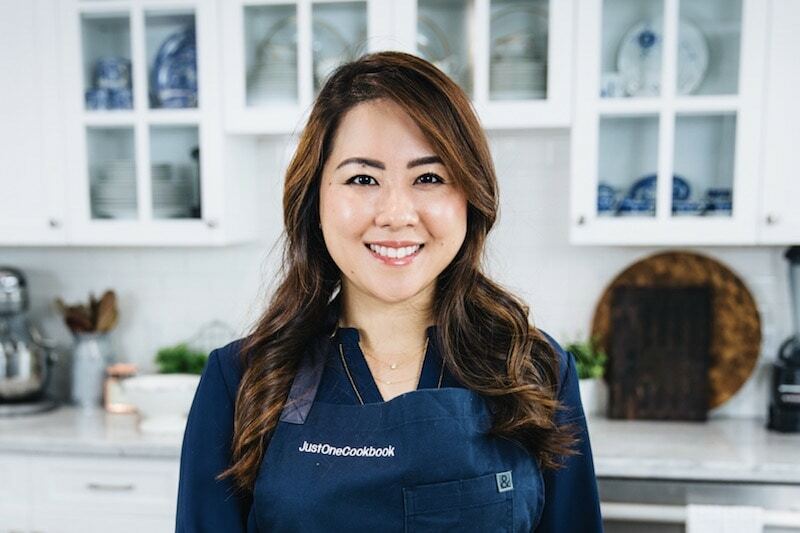 So happy to know that I’m cooking my recipes with you at a different location! 🙂 It’s good to know you like the pictures for ingredients. Thank you for your feedback! Hi Jacquie! Your words are so sweet and thank you so much for your feedback. 🙂 I’m just happy that you’re enjoying contents I’m producing. Thanks for following along! I made this dish following your recipe..it was excellent.. Kids love it. Thank you. My husband and I lived in Japan for over 10 years and I used to make cream stew using roux. It is the first time I made the sauce from scratch. I am surprised how easy and tasty it is. It is going to be a nice addition to our family meals. I can’t wait to try other recipes! This looks so comforting! I’m having a hysterectomy next week & am hoping to eat this during recovery. Do you think if I cook the entire recipe, let it cool & freeze it would be ok? I was thinking of freezing it & when I’m ready to eat it I can put in fridge over night & just spoon portion I desire & reheat in microwave or stovetop. Thoughts? I’m batch cooking bonito broth today so I can make a few quick soups too.